Nonsteroidal anti-inflammatory drugs (including mefenamic acid) may rarely increase the risk for a (sometimes fatal) heart attack or stroke. This effect does not apply to low-dose aspirin. (See Drug Interactions section.) This effect can happen at any time while taking this drug but is more likely if you take it for a long time. The risk may be greater if you have heart disease or increased risk for heart disease (for example, due to smoking, family history of heart disease, or conditions such as high blood pressure or diabetes). 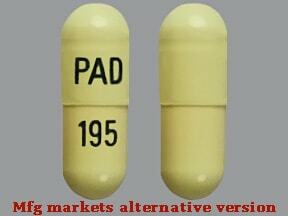 Do not take this drug right before or after heart bypass surgery (CABG). Also, this drug may rarely cause serious (rarely fatal) bleeding from the stomach or intestines. This bleeding can occur withoutwarning symptoms at any time during treatment. Who should not take Mefenamic Acid? Read the Medication Guide provided by your pharmacist before you start using mefenamic acid and each time you get a refill. If you have any questions, consult your doctor or pharmacist. Take this medication by mouth, usually 4 times a day with a full glass of water (8 ounces or 240 milliliters) or as directed by your doctor. Do not lie down for at least 10 minutes after taking this drug. If stomach upset occurs, take this medication with food or milk. Do not take mefenamic acid with antacids unless directed by your doctor. Certain antacids may change the amount of mefenamic acid absorbed by the body. Dosage is based on your medical condition and response to therapy. To reduce your risk of stomach bleeding and other side effects, take this medication at the lowest effective dose for the shortest possible time. Do not increase your dose, take it more frequently, or take it for a longer time than prescribed. This medication usually should not be taken for more than 7 days at a time. If you are taking this drug on an "as needed" basis (not on a regular schedule), remember that pain medications work best if they are used as the first signs of pain occur. If you wait until the symptoms have worsened, the medicine may not work as well. If you are using this medication for painful periods, take your first dose as soon as your period starts or pain begins. Usually, you will only need to take it for the first 2 to 3 days of your period. What conditions does Mefenamic Acid treat? Tell your doctor right away if any of these unlikely but serious side effects occur: fainting, persistent/severe headache, hearing changes (e.g., ringing in the ears), fast/pounding heartbeat, mental/mood changes, stomach pain, difficult/painful swallowing, swelling of the ankles/feet/hands, sudden/unexplained weight gain, vision changes, unusual tiredness. Stop taking mefenamic acid and tell your doctor right away if any of these rare but very serious side effects occur: easy bruising/bleeding, signs of infection (e.g., fever, persistent sore throat), unexplained stiff neck, change in the amount/color of urine. This drug may rarely cause serious, possibly fatal liver disease. If you notice any of the following rare but very seriousside effects, stop taking mefenamic acid and consult your doctor or pharmacist right away: persistent nausea/vomiting, severe stomach/abdominal pain, weakness, dark urine, yellowing eyes/skin. List Mefenamic Acid side effects by likelihood and severity. Kidney problems can sometimes occur with the use of NSAID medications, including mefenamic acid. Problems are more likely to occur if you are dehydrated, have heart failure or kidney disease, are an older adult, or if you take certain medications (see also Drug Interactions section). Drink plenty of fluids as directed by your doctor to prevent dehydration and tell your doctor right away if you have a change in the amount of urine. What should I know regarding pregnancy, nursing and administering Mefenamic Acid to children or the elderly? Some products that may interact with this drug include: aliskiren, ACE inhibitors (such as captopril, lisinopril), angiotensin II receptor blockers (such as valsartan, losartan), cidofovir, corticosteroids (e.g., prednisone), fluconazole, ketorolac, lithium, methotrexate, "water pills" (diuretics such as furosemide). Check all prescription and nonprescription medicine labels carefully since many medications contain pain relievers/fever reducers (aspirin, NSAIDs such as celecoxib or ibuprofen). These drugs are similar to mefenamic acid and may increase your risk of side effects if taken together. However, if your doctor has directed you to take low-dose aspirin to prevent heart attack or stroke (usually at dosages of 81-325 milligrams a day), you should continue taking the aspirin unless your doctor instructs you otherwise. Ask your doctor or pharmacist for more details. This medication may interfere with certain laboratory tests (e.g., urine bile test), possibly causing false test results. Make sure laboratory personnel and all your doctors know you use this drug. Does Mefenamic Acid interact with other medications? Laboratory and/or medical tests (e.g., blood pressure, complete blood count, liver and kidney function tests) may be performed periodically to monitor your progress or check for side effects. Consult your doctor for more details. 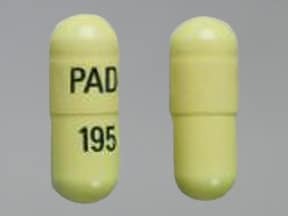 This medicine is a yellow, oblong, capsule imprinted with "PAD" and "195". 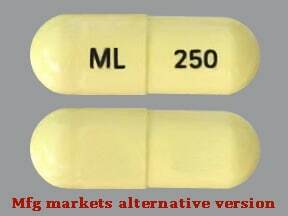 This medicine is a yellow, oblong, capsule imprinted with "ML" and "250". 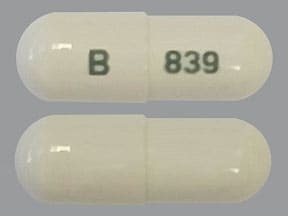 This medicine is a white, oblong, capsule imprinted with "B" and "839". 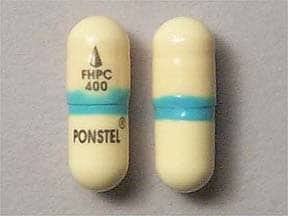 This medicine is a ivory, oblong, capsule imprinted with "logo and FHPC 400" and "PONSTEL". 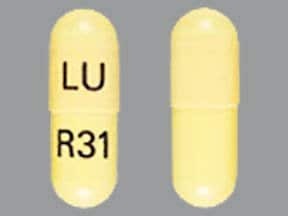 This medicine is a ivory, oblong, capsule imprinted with "LU" and "R31". Are you taking Mefenamic Acid? Are you considering switching to Mefenamic Acid? How long have you been taking Mefenamic Acid?